Our college, university and prep school blazer buttons are traditionally crafted. 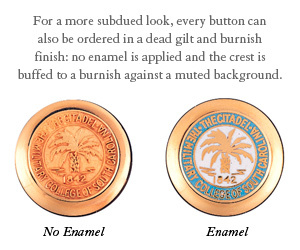 Brass buttons are die struck with the emblem of the school and colorful cloisonné enamel is hand applied. 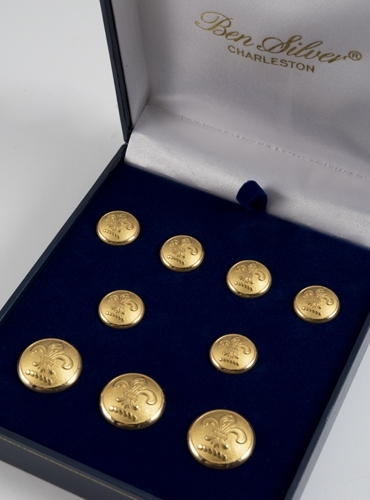 The buttons are then plated with 24kt gold for greater durability through the dry-cleaning process. For a more subdued look, every button can also be ordered in a dead gilt and burnish finish: no enamel is applied and the crest is buffed to a burnish against a muted background. There is no additional charge for this finish. 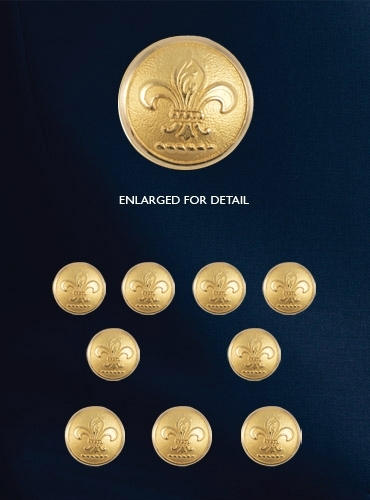 For a truly unique gift, we also offer our Blazer Buttons in precious metals - including 14kt gold fill, Sterling Silver, and 14kt gold. All are available as a special order and can not be returned. Additionally, 14kt gold jewelry requires a 50% deposit. Because of the current volatility of the precious metal commodity market, the price for any blazer buttons, cufflinks or stud sets in 14kt gold, gold filled or Sterling silver may be subject to change. For complete information and pricing, please call our customer service staff. Each set of Blazer Buttons is attractively gift boxed, and contains 3 large coat buttons measuring 7/8" and 6 small sleeve buttons measuring 5/8". All college designs are sold subject to applicable licensing requirements. Please call customer service at 1-800-221-4671 if you have a question about a particular school, or if you need extra buttons.